When James Salmons proposed to Brogan Beardsley on her 19th birthday after just 10 months of dating, the couple knew they wanted to celebrate in style. 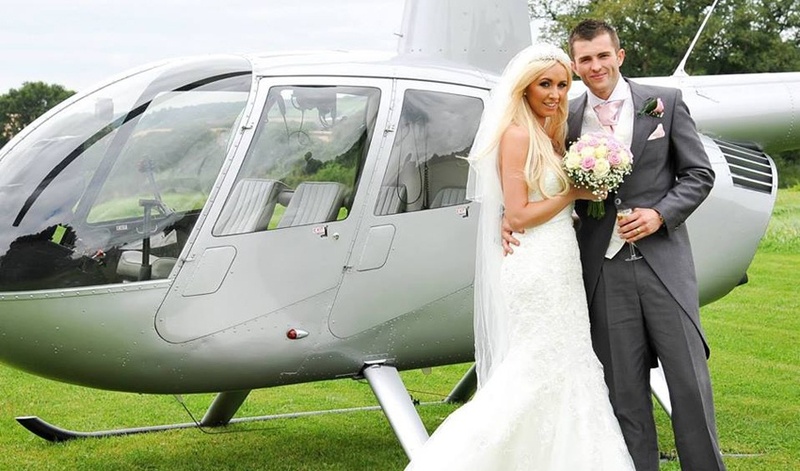 They wanted to travel to Shottle Hall in a way that reflected the celebration of their big day, but which also shocked and surprised their guests: a helicopter. The 21-year-olds, who live in Heanor, tied the knot in church before flying in to Shottle for their wedding breakfast and evening celebrations. How we met: A mutual friend introduced us on a night out in April 2010. We just got talking and really clicked. We started officially dating the following month. Proposal: We were out for a meal for my birthday in March 2011 at Perkins, in Nottingham. James was really nervous all throughout the meal and kept going out for lots of cigarettes. I wondered what was wrong with him but he kept telling me ‘nothing, nothing’. When dessert was brought out – my favourite, chocolate torte – will you marry me? was written on the plate. When I looked round, James was down on one knee holding a ring. It was a shock, but a lovely shock. We had spoken about getting married, saying that we both wanted to, but for him to propose was still a big shock. He asked my parents in advance to get their permission too, so they knew before me! The ring: James picked the ring himself, it’s got four diamonds and looks like a flower – that’s the only way I can think to describe it, it’s beautiful and so sparkly. Rings that I wore before always fit on James’s little finger so that’s how he knew what size to get. It was so romantic; I was speechless when he told me he picked it on his own. When we were looking around for the venue, I came across Shottle Hall online and just looking at the pictures I knew it would be perfect. 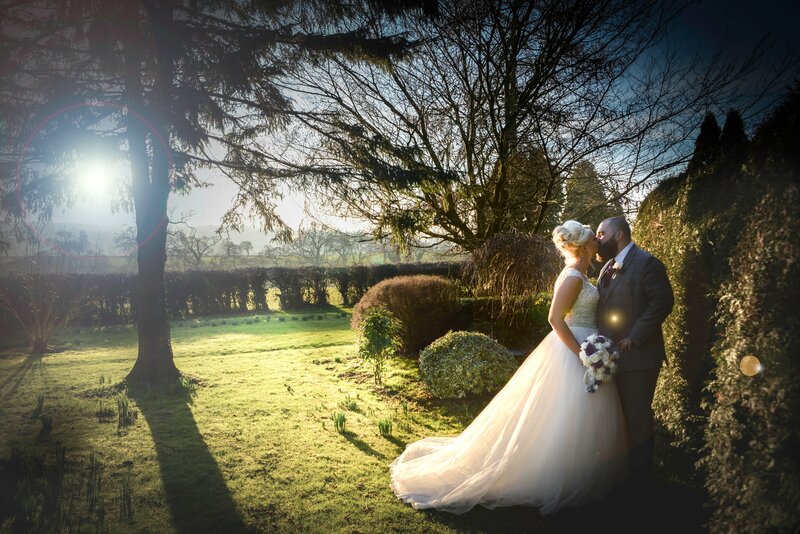 Shottle Hall: When we were looking around for the venue, I came across Shottle Hall online and just looking at the pictures I knew it would be perfect. And we both loved it. When we came to have a proper look around we fell in love with it even more, we knew this was where we wanted to celebrate our wedding. We had 65 people for our wedding breakfast and then 200 came for the evening reception. 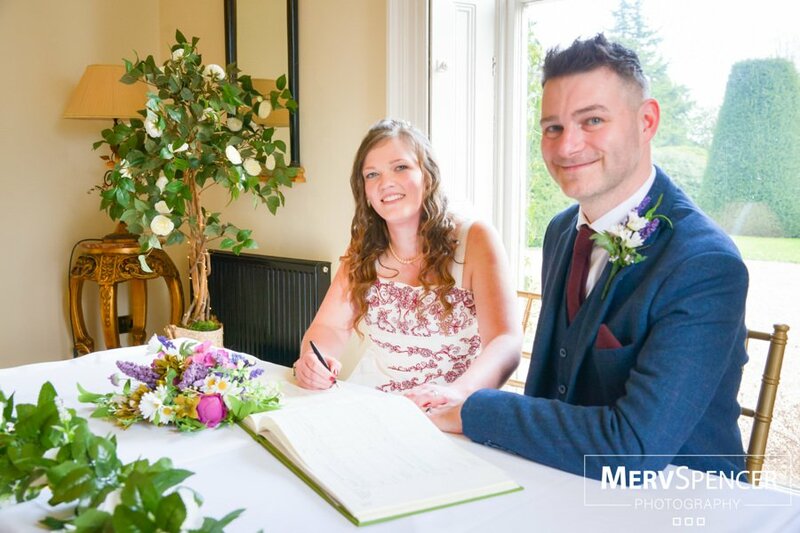 Ceremony: We got married at St Mary’s Church in Greasley in Nottingham before going on to Shottle for our wedding breakfast. Transport: We had a Rolls-Royce Phantom to take me and my four bridesmaids to the church from Heanor on the morning of the wedding. Then after James and I were married, we hired a helicopter to take us to Shottle. The Phantom took us to Hucknall airfield where we got on and it flew us to our reception and landed in the grounds of Shottle. It was amazing and no one knew about it. I spent the whole time worrying about my veil and whether my Christian Louboutin shoes would fall out! The dress: I saw the dress I wore very early on in a wedding magazine. I looked around at others a little bit but I loved this one so much that I found a local stockist. It’s from Mori Lee by Madeline Gardner. It’s beautiful and not the sort of dress people expected me to be wearing. It’s simple and very fitted with a fish tail. I think everyone expected me to be in a big, big dress. Bridesmaids: I had four bridesmaids and I struggled for a long time with what dresses they were going to wear. I was in House of Fraser, just walking through when I saw the dresses that became bridesmaids’ dresses. They were by Ted Baker, and baby pink in colour. They were floor-length flowing gowns with rose gold decorations. They were beautiful. I had four bridesmaids all together. My maid of honour was Laura Rose Neal, who I got to know really well through work. I also had Anastasija Lukic – who I know from a German exchange when I was at school. We got really close and try to see each other at least once a year, so it was great that this year she could come over here for such a special occasion. Lavheen Powell was one of the girls I used to work with and is one of my best friends. I also had Shauni Granger, my oldest friend from school. Suits: We hired the suits from Jon Paul Menswear in Derby. James and his best man, Jack Scott, who he knows through Langley Mill Cricket Club who they both play for, both had tails – James didn’t like the top hat so decided against wearing one. They wore grey suits with pink ties to match the bridesmaid dresses and the colours throughout the whole wedding. Theme: We used Wedding Event Design Studios, based in Ashbourne, for the table design and the chair covers. We had mirrored plates on the tables, with flowers in martini glasses. There were cameras on the tables too for people to take their own informal pictures of the day. There were also some colouring books and bubbles to keep the children entertained while the speeches were going on. We wanted it to be really fun for everyone and didn’t want the little ones to get bored. 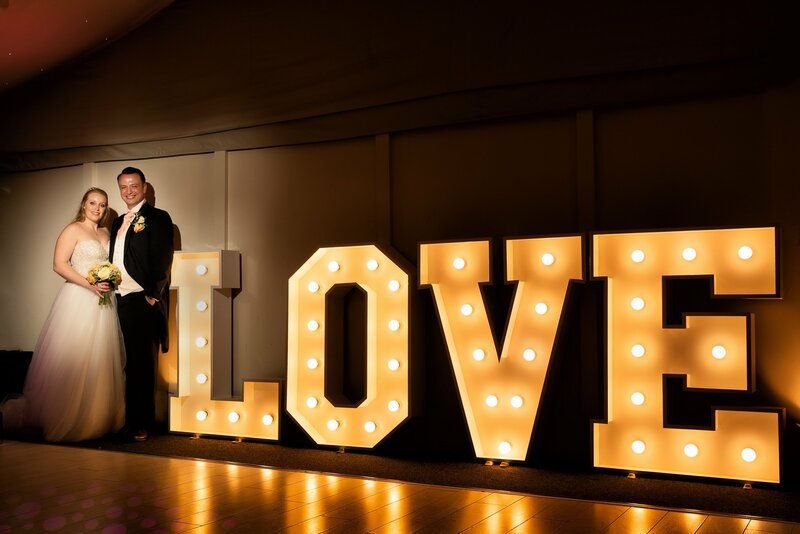 Evening: We had a photo booth from Midlands Party Photo Booth Hire for the reception and a chocolate fountain from Sensations Chocolate Hire. We wanted a couple of things that were different and that would be fun. We had a band, Smoke Screen, playing in the evening and a DJ, Paul. We had our first dance to the Jason Mraz song, I won’t give up. 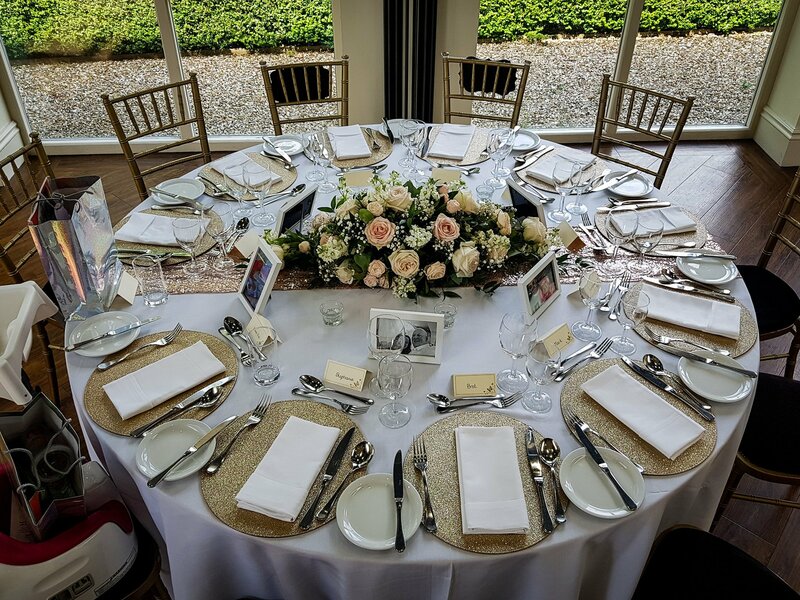 Stationery: Our invitations were from Bride and Groom Direct, and the table plans and name cards for all the tables were from No9 Design, in Oakwood. They were simple, but so beautiful. They fit in with the colour scheme of the whole wedding too; we wanted everything to be matching. Flowers: We had flowers from The Greenery in Town Street, Duffield. We had pink and white roses in the bouquets for me and my bridesmaids and on all the tables as the centre pieces. Cake: We had two cakes, one for the day and one for the evening. They were both from Classy Cup Cakes, in Nottingham. The day cake was a three tier plain iced cake with a pink ribbon around. 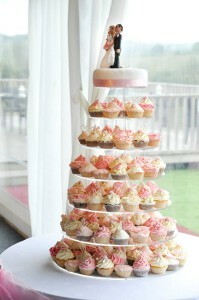 Each tier was a different flavour: the bottom tier was raspberry ripple, the middle was chocolate and the top was banana. For the evening cake, we had 200 cup cakes – one for each guest – and a top tier cake which was Victoria sponge. They were amazing and looked – and tasted - so good. Everyone was impressed. Honeymoon: We went to Cancun in Mexico for two weeks for our honeymoon. It was incredible. We got married on the Friday and then went down to Gatwick on Saturday ready to fly out on the Sunday. The whole holiday was incredible. We had a butler for our room that got us everything we wanted. We’d go back in a heartbeat if we could. Photographer: Merv at Field Photographic took our pictures and he was great. There are lots of the traditional posed photos but there are lots of the guest and the tables too. We also had Angela from Derbyshire Wedding Video to film the whole day; she was with us until about 10pm, capturing every aspect of our wedding day. Best piece of advice: I would definitely recommend that everyone has a videographer – the day goes so fast and you don’t have time to stop and think. There are bits that you miss and the video is perfect for capturing everything.